There's nothing quite like a BBQ pit blessed by decades of grease. But for every salt- and pepper-seasoned family legacy, there's a new upstart dreaming of building their own smoky dynasty. 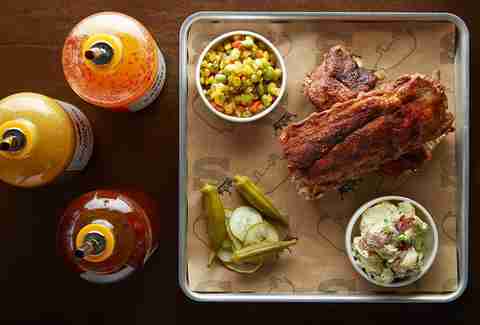 To salute these young-gun pullers of pork, we've compiled a list of the 15 best BBQ joints that have opened in 2013 and 2014. Eat up, and if we missed any, dump some sauce in the comment section. Run by the dude behind some of the Bay Area's best beer bars (The Trappist, Mikkeller Bar), Perdition is drawing rave reviews from Tex-pats for some of the most legit Q in the East Bay... and it's smoked right in the center of the restaurant. Black Angus brisket and Compart Duroc pork shoulder are the star attractions, but the supporting cast of 43 taps is nothing to scoff at. Add in the fact that they're regularly tapping rare firkins like Magnolia's Blue Bell Bitter and running tap takeovers by the likes of Cellarmaker Brewing Company, and Perdition starts sounding much more like heaven. With fires fanned by a guy who used to run the pits at the famous Hill Country and some secret weapons from the catering arm of the business (chicken and red velvet waffles! 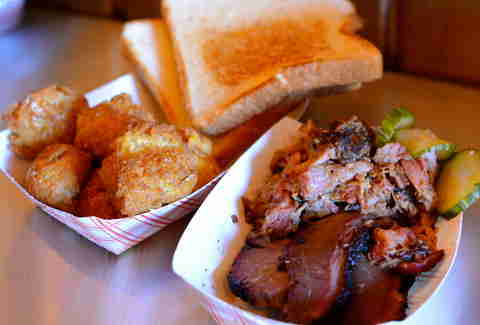 ), DCity has taken the Capital City BBQ scene by storm since opening in late 2013. The meat is smoked with a mix of hickory and cherry wood with a rub of Texas nostalgia thanks to the pitmaster's Central Texas roots. There's no room for amateurs in Austin's much-debated BBQ scene, and after opening in mid-2013, Kerlin quickly established itself as a serious player. The Arizona transplant behind the operation began as a backyard enthusiast before hitting the competition scene and taking home a grand prize on his first outing. He's since embraced Central TX tradition with a standard post-oak wood supply, but pushes the envelope when it comes to meat quality by only using Prime Angus. Not many pitmasters can boast graduating first in their class from Le Cordon Bleu. Ronnie Killen's background in fine dining turned meatier with a steakhouse opened in 2006 (lauded as the best in the city by both Houston and national press), but the fires began burning brightest when he launched a series of weekend pop-up BBQ events in 2012. In January 2014, he went brick and mortar, upping his production of salt- and pepper-rubbed meats to over 2,000lbs per day, with the goal of not only putting the Houston area on the BBQ map, but daring to overtake his Austin brethren. When the guys behind the best burger in Dallas decide to open a BBQ joint, you know they mean business. 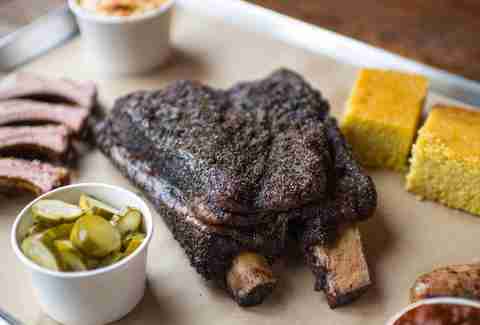 Opened in April 2013, Slow Bone has quickly risen to the upper echelon of Dallas BBQ (#3 according to their peers) with a jiggletastic brisket that they actually serve inside of hush puppies. When restaurateur Brandon Sodikoff, who already brought Chicago its best burger and best donuts announced, he was taking on BBQ, the anticipation was intense. 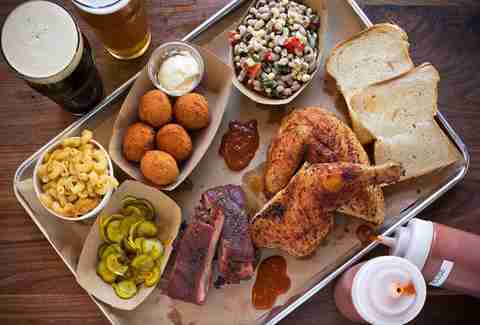 The result toes the line between place to be seen and serious BBQ joint. You enter from a cobblestoned back alley into an old warehouse space that's pumping out impressive standards like tender pork ribs, house-ground hot links, and juicy, stunned-silence-inducing brisket. Sauces like the coffee-infused Brown Thunder are tasty if a bit less thrilling, but the important thing is you don't feel like you need them. 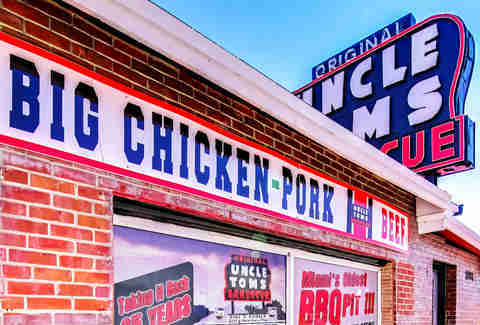 After having about the roughest few decades a barbecue joint could have (serial sanitation violations, a debilitating fire, briefly turning into a Cuban restaurant), the landmark Uncle Tom's sign on Little Havana's Calle Ocho once again stands over some of the best barbecue in the city. Right after new ownership took over in 2013, said fire forced them to gut the old space (which had been around since before Miami had AC) and start again from scratch. The only thing that's recognizable from the Yelp-maligned place of yore is the sign and the original, cinnamon-accented barbecue sauce, a recipe the new owners actually got from Uncle Tom's family that's strangely delicious on top of their street corn, served with chili mayo and Cotija cheese. From a group of ATLien restaurateurs who've put their stamp on the city through restaurants like Tin Lizzy's and by organizing ridiculous social events like the LepreCON, Smokebelly just opened their doors in Atlanta's new Buckhead mixed-use district with slick Southern decor like pig-shaped planters. The food's a mix of 'cue and comfort, from updated takes on classic sides like smoky braised kale and bourbon-baked sweet potato souffle, to plates of wet or dry baby backs and chopped beef brisket. 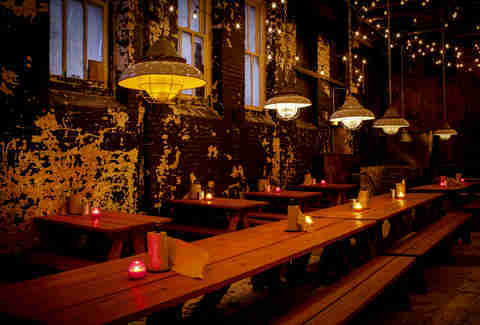 Add craft cocktails and 20 taps, and this place will please even the pickiest of bellies. Family feuds are nearly as big a part of Texas BBQ tradition as salt and pepper, so it's natural that the brisket at the new Austin offshoot of the Lockhart legend Black's would be served with a side of drama. The owners are a pair of brothers with fourth-generation Black blood who're aiming to return to their family's old way of doing things, even if that means weathering lawsuits over the restaurant name. 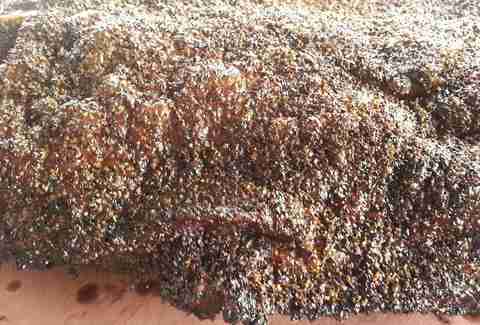 They only just opened their doors in June 2014, so the massive smoker's still getting dialed in, but early tastes reveal that this will soon be a brisket to be reckoned with. Ryan Farr is an SF legend for butchering meats, AND he grew up in Kansas City, so it just seemed logical that he would eventually take over one of the only remaining wood-fired BBQ pits in the Bay Area, and churn out amazing stuff. Though his eats don’t conform to one style, everything is damn good here, from the brisket and hot sausage, to the BBQ sandwich, pork spare ribs, and even the Frankaroni, which includes an entire 4505 hot dog hidden in mac & cheese. Maybe don’t eat for a day or two before showing up. Tucked inside a Denver strip mall, this unassuming Memphis-style BBQ hole-in-the-wall is the result of an Arkansas native bringing her passion for smoked meats (and the Razorbacks -- it's literally Hog heaven inside) to the Mile High masses. 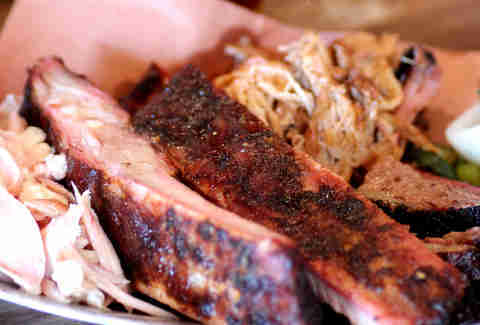 The ribs and smoked pork are highlights, as are any of the five homemade sauces worth dousing the meat in: Carolina, Georgia, Memphis, sweet, and hot. 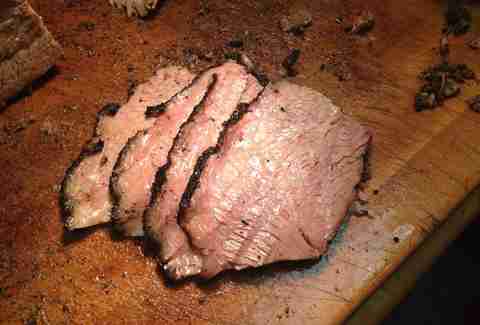 Show up on Saturday and get the brisket -- it runs out in about two hours, and they'll close up shop soon after. And the red velvet cookies are three for a buck if you still have room after devouring a two-meat combo plate that comes with two sides, dessert, and a drink. You won't. 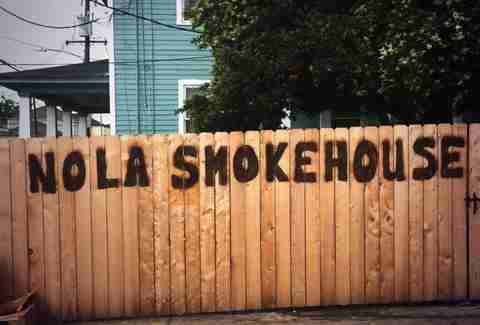 After a few years of wildly successful pop-ups, the top hogs of the New Orleans BBQ scene have gone permanent with a nondescript brick-and-mortar dishing out smoked meats from a chef with 25 years in the NOLA restaurant scene. The Q's cooked on a mix of hickory and fruitwood in order to give it a deeper smoke penetration. Arrive on your lucky day and you might just score some pork BBQ baklava. 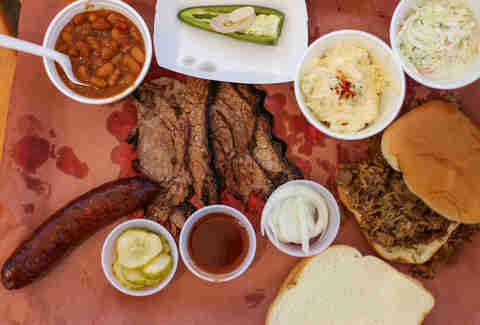 Located in Red Hook -- just down the street from Sixpoint Brewery and the Cacao Prieto chocolate factory/distillery -- Hometown trades in Texas Q cooked with secrets learned from the owner's mentor at Louie Mueller BBQ in Taylor, TX. 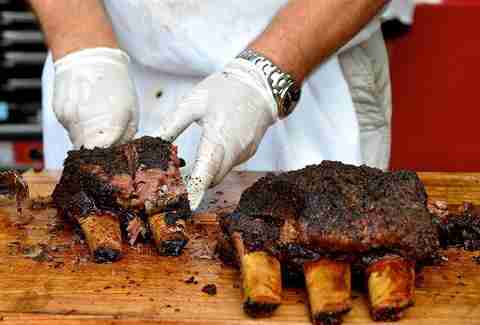 The massive beef rib is the showstopper and has earned its pitmaster an unprecedented amount of fast fame in the world of slow flame, including an appearance on Good Morning America. Be sure to salute the American flags on your way out, if you're not too full to lift your arms. 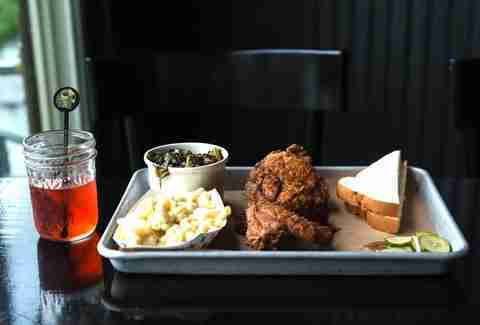 Bringing a taste of the South to the Pacific Northwest, B&B's helmed by a North Carolina native who's brought with him a killer fried chicken recipe with a marinade of lemon, thyme, cayenne, and garlic. 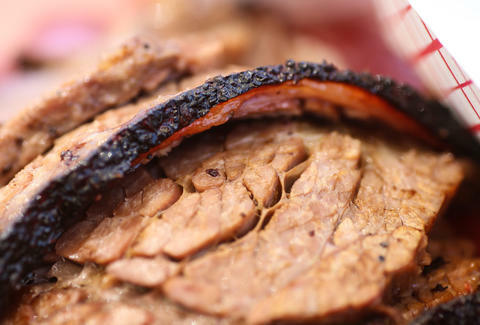 More Carolina goodness comes in the form of a slow-smoked pork shoulder, and the meat menu is rounded out with brisket, housemade andouille, sweet ribs, and smoked pork belly bacon. Wash it down with one of their fine bourbons -- served in miniature Mason jars. 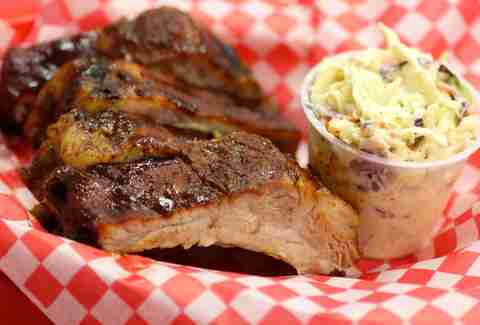 Farmer's market sensations and competitive Q circuit junkies, Little Miss has created a BBQ oasis in the barren smoked meats desert known as Arizona. The owner's parents live in Texas, so he's made countless "research trips" to revered spots like Franklin, John Mueller Meat Co., and La BBQ. 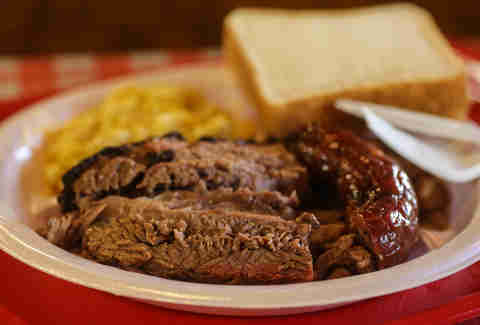 The studiousness shows through in Little Miss's signature brisket, cooked in a 14ft smoker. Arrive early and don't be surprised if they still sell out. Dan Gentile is a staff writer on Thrillist's national food and drink team. He now has souvenir cups from both Black's and Terry Black's and they are throwing each other serious shade on his shelf. Follow him to inanimate beefs at @Dannosphere.